I value handmade gifts. And I love beautiful yarns and knitting. The problem is that I don't know how to knit. I've tried to learn, but I learned to crochet when I was 5 so the knitting never seems to stick. My solution? Using a fun and easy knitting loom to make simple handmade gifts, like this knitted scarf. The way a knitting loom works is that you wind the yarn around the pegs twice around the loom, and then you use a little hook to pick up the lower loops and pull them up over the peg, creating a stitch. I bought mine, but you could make one yourself with a little ingenuity. This particular loom was made by Knifty Knitter and came with a set of four looms that you can use to make scarves, hats, flowers and more. I got it at Jo-Ann fabrics for $14. To make the scarf, I picked up two skeins of yard, one in a super soft twisted natural color, and one in a black eyelash yarn with tan and brown kernels. I started with the eyelash yarn, did 20 or so rows of that, then switched to the tan yarn and just knitted away until the scarf seemed long enough (I like a good, long scarf), and then did another 20 or so rows of the eyelash yarn. Then I used a crochet hook to finish the end and get the work off the loom. Easy, peasy! It only took a couple of evenings workign while I watched TV, and now I have a great handmade gift for someone on my list. When I was done, I had enough left of each to do a hat, but not another scarf. The yarn was about $10. So it's not cheaper, but it's handmade by you, and that's what counts. And it was fun! I am already planning another scarf, maybe experimenting with other yarns, stripes or other fun variations. I'll post them as I do them. 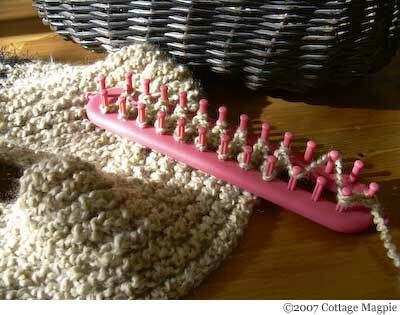 Have any of you ever used a knitting loom? Do you have any brilliant ideas or projects to do? Let me know!